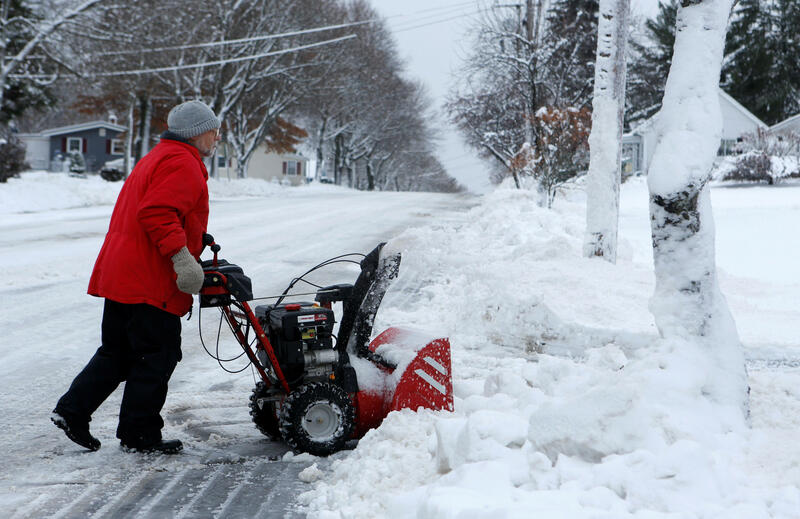 PORTLAND, Maine -- A winter storm brought more than 2 feet of snow to parts of northern New England overnight, and more than 100,000 homes and businesses were without power by Friday morning in hard-hit Maine. In the region’s first major storm of the season, the National Weather Service received multiple reports of snow falling at a rate of 6 inches per hour. Powerful bands of snow buried some areas knee-deep while other places just miles away received mostly rain. “It went from just a garden-variety, low-pressure system to a turbocharged storm,” said weather service meteorologist Eric Schwibs. Hundreds of cars slid off roads from the beginning of the storm on Thursday through Friday morning, when people began digging out. Emergency crews worked through the night after more than 80 wrecks were reported, CBS News correspondent DeMarco Morgan reports. Some plows got stuck in the heavy snow, blocking roads temporarily. In Vermont, state police said a 69-year-old man was killed in Cornwall when his car went off the road in slippery conditions Thursday and crashed into a tree. In Maine, a man died in a fire at the height of the storm in the town of Pownal, but it wasn’t clear if the weather played a role. Southern and western Maine turned out to be in the storm’s bullseye, but the storm played a game of hop-scotch, pummeling some communities with snow while leaving others just miles away drenched in rain. Big snow totals in Maine included 27 inches in Standish and Naples, 25 inches in Parsonsfield, and 22.7 inches in Hollis. In Portland, Richard Haynes found out the hard way about the icy conditions. He slipped Thursday night and ended up in the emergency room. The barometric pressure reading was expected to close in on readings from a crippling storm on Valentine’s Day 2014. That storm canceled flights, knocked out power for thousands and claimed more than two dozen lives on the East Coast. Because of the power outage Friday, the National Weather Service couldn’t immediately provide a comparison of the two storms. Ski areas, meanwhile, cheered the winter onslaught. “Yesterday’s nor’easter is today’s invitation for skiers and riders to come out and enjoy the fresh new snow that the heavens dumped on New Hampshire ski areas,” Ski New Hampshire, a trade organization, declared Friday. Before going anywhere, motorists first had to dig out snow-covered cars that looked like igloos. The task was made easier by a bright sunny sky and temperatures that began climbing above freezing.